If you have a blocked or even a slow running main sewer, sink, toilet, tub or any other drain stoppage in your house, give us a call for a low price to unclog any one sewer or drain. We also have specialized equipment such as High Pressure Water Jets, and industrial rotor machines for heavy and thick root problems. We also offer sewer line repair, replacement and more. Making sure you have a safe and secure sewer line leading out to your sewer system is highly important. Problems with sewer lines can lead to clogs, corrosion, cracked or broken pipes, faulty or leaking joints, encroaching roots and various blockages and leakages. 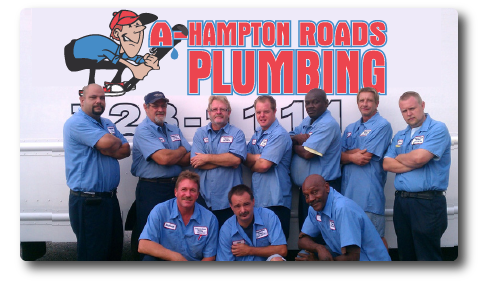 Let our experts at A – Hampton Roads Plumbing ensure that your sewer pipes are operating smoothly, safely and efficiently. Blast away the buildup and sludge that is causing your plumbing backup beneath the floors of your home! You can count on our trained plumbing technicians to clear out even the toughest, most serious of backups with our high-pressure hydro-jetting system. It is safe and proven. Whether it’s a deep root problem in Chesapeake or Virginia Beach, or a buildup of sludge in a main water line in Newport News or Norfolk, A – Hampton Roads Plumbing will respond promptly with honest, affordable and dependable drain cleaning services. REQUEST A FREE DRAIN CLEANING ESTIMATE!